These trousers by Cowgirl Tuff have a natural waist fit which means they have a slightly higher rise that sits comfortably at your waistline and are more relaxed at the hips and thighs. The back pockets sit higher for a more flattering look. Made with 70% cotton,28% Polyester, and 2% spandex. 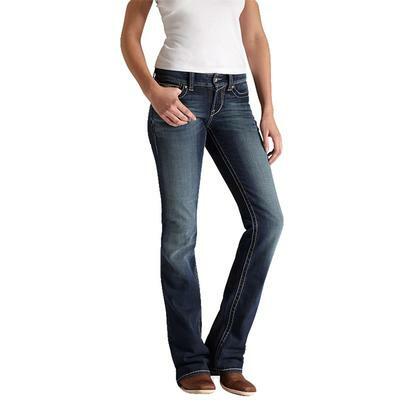 These boot cut jeans by Ariat have a mid rise waist and feature classic five pocket stitching with fading and whiskering throughout. These Ariat mid-rise jeans feature a fabrication of soft cotton with slight stretch for durability that ensures a wide range of movement. These trousers are perfect to dress up an outfit. The spitfire features hand sanding, whiskering, contrast stitching, and sgene technology. This jean is fitted to perfection. 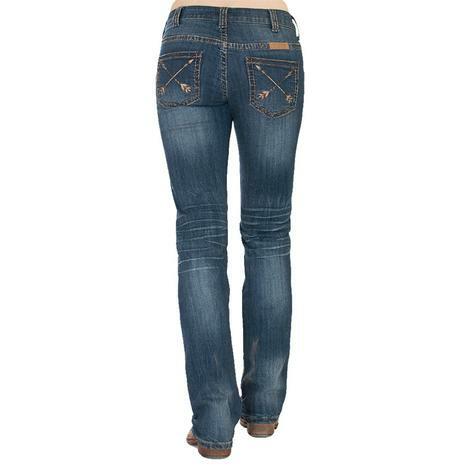 These bootcut Cowgirl Tuff jeans feature a no-gap waistband and dark wash natural waistline with no whiskers or fading. Dark wash midrise with slightly higher rise in back boot cut jeans with whiskering, 5 pocket styling, barbed wire embroidery on the back pockets by Cowgirl Tuff. 98% cotton 2% Spandex. These high-rise skinny jeans are always a good idea. 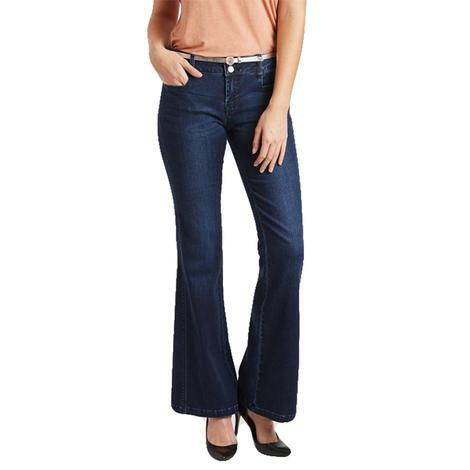 These jeans are sculpted fit that flawlessly accentuate your figure. They match well with a tunic shirt and your favorite pair of boots, heels, or flats. They are totally universal and a comfortable wear all day long! 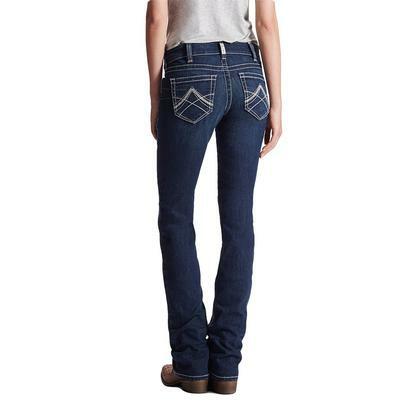 Get the REAL difference in these jeans by Ariat. 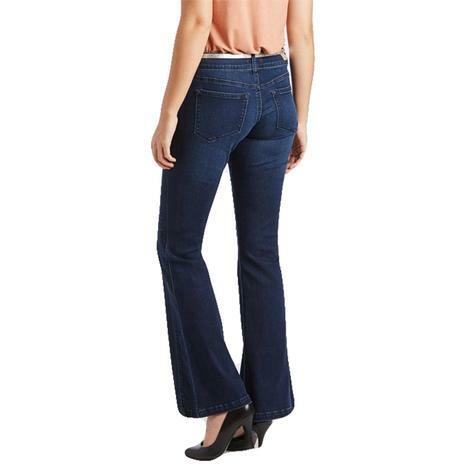 They are a mid-rise jean with a boot cut leg that will look great with your favorite boots! The Tulip style pocket is perfect for spring! 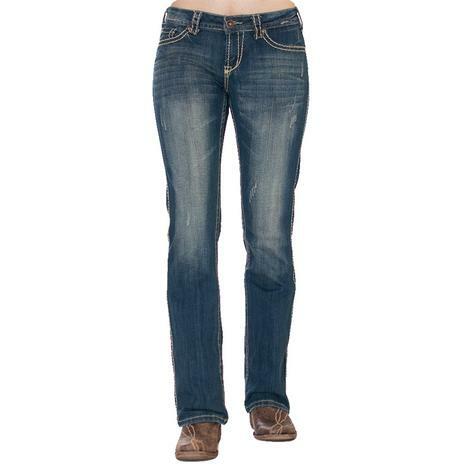 These Dear John Denim Liam Straight Leg Women's Jeans in Parkside wash are casual and cute! They can be worn folded up into a cuff or straight. If you aren't a fan of flare or skinny jeans then you'll love these! Dear John Denim's Rosie Rocket Flare Dark Denim Wash jean has a perfect fit with perfect flare every time! 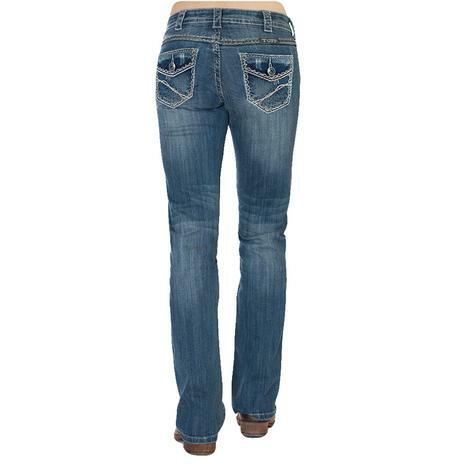 This flare jean is a must have style for your look and features the Rocket wash with five pocket styling. You'll fall in love this denim because it can be dressed up with a sassy set of heels and a statement necklace for a chic polished look! 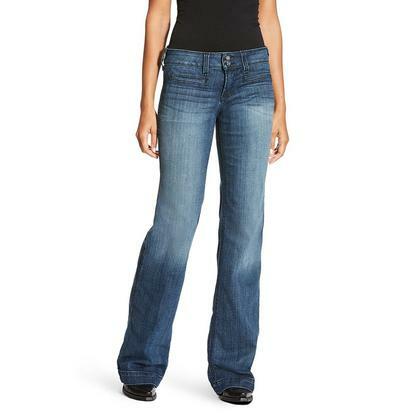 Dear John Denim's Gisele Highrise Skinny Black pants are a staple item for your wardrobe. Each pair fits snug and sleek to trim out your best features. Ankle fit and button closure, made of soft cotton and spandex. Completley flattering. 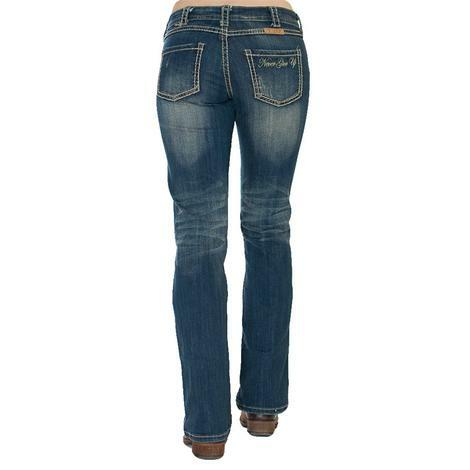 These jeans by Cowgirl Tuff are the Classic Mustang style that are dark washed that are completely flattering. These jeans feature hand sanding and whiskering. They are stitched in a cream thread and have a barbed wire design on the back pocket. The natural waist fit is going to be totally comfortable for in the saddle or on the dance floor. Cowgirl Tuff brings back their Never Give Up jeans in a natural waist fit which comes up about an inch higher all around than the average Cowgirl Tuff mid-rise jeans. They are a medium wash denim with bold tan stitching, heavy fading, and light distressing and whiskering. What makes these jeans so unique is the Cowgirl Tuff insignia "Never Give Up" embroidered in cream stitching on the right back pocket. 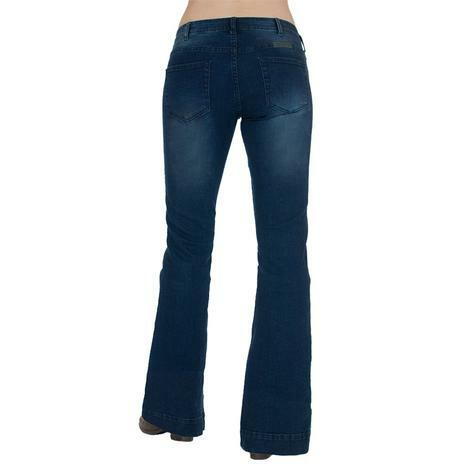 These Cowgirl Tuff Peacemaker jeans are a medium wash with light fading and whiskering. The jeans is stitched in cream, tan, and brown thread, including the embroidered arrows on the back pockets. The jeans have a "natural fit" waist, which means they come up a little higher all the way around than most Cowgirl Tuff jeans. They are relaxed in the hip and thigh for ease of wear in and out of the saddle. 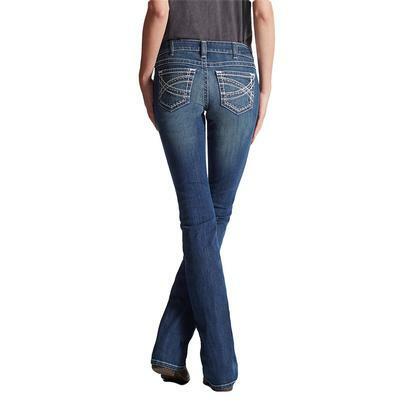 Cowgirl Tuff's Women's Hustle Jeans in medium wash have a faux pocket with a sewn on button giving the illusion of flap pockets. They are stitched with cream, tan, and brown thread throughout the entire jean and include the signature barbed wire design across the pockets. The pen pocket also includes the criss crossed barbed wire design for a subtle flare! 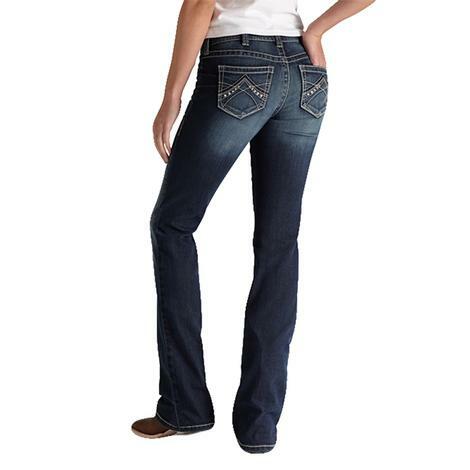 These Cowgirl Tuff Company Forever Tuff jeans have a front and back rise that sits right on the waist with a more relaxed fit through the hips and thighs. These jeans are a forever classic with dark wash denim and complimenting all-over black stitching. They have no distressing, some whiskering, and include the signature barbed wire embroidery on the back pocket. 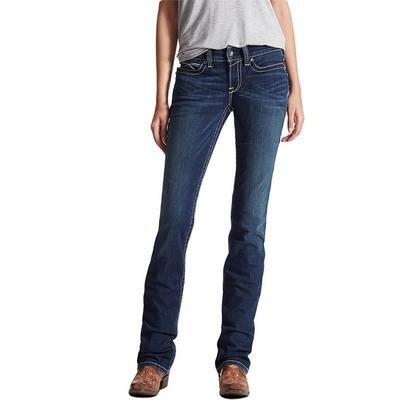 These Cowgirl Tuff Wildfire jeans have a mid-rise and are higher in the back. The jeans are completely stitched in hot pink and neon orange and have a barbed wire design on the back pockets. 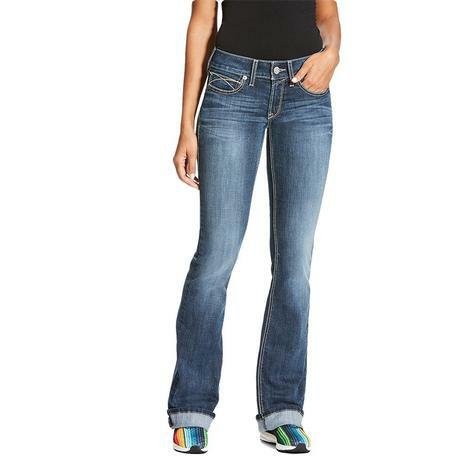 Theses are a medium to light wash jean with heavy whiskering and 2% spandex for added stretch. 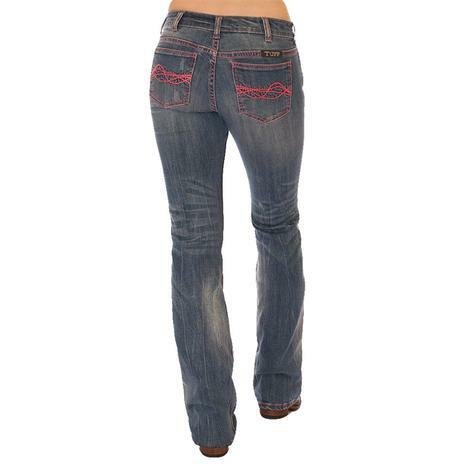 These Dear John Gisele high rise red jeans feature the five pocket design, a zipper and button. The soft and stretchy handle on these are made to go where you go. The perfect everyday jean. Front Rise: 9 1/2", Back Rise: 14", Inseam: 28"